"There are lots of places where people with mathematical skills can find work,” says Michael Pearson, Associate Executive Director of the Mathematical Association of America. You don’t have to teach math or be a mathematician when you graduate with a math degree. There are many jobs for math majors that don’t even require any special use of mathematics. That’s because math teaches its students logic and analytical thinking, which helps in most careers. According to Connie Jung, an undergraduate advisor at the University of California, Los Angeles, a few years ago it seemed like every math major wanted a job in finance. Now, since the recession of 2008, teaching is more popular. Actuarial science (applying mathematical and statistical methods to assess risk in the insurance and finance industries) is growing in popularity too—maybe because it’s a specialized field that touches on finance, Jung says. These occupations are just some of the more popular job destinations for math majors. When combined with any number of majors or minors, the possibilities are endless where a math degree can take you. At Truman State University in Kirksville, Missouri, math and computer science are the same major and come with minors like statistics and mathematical biology, which allows for a greater variety of choices available to students post-graduation. These minors help students prepare for the real world of work. “With careers becoming more specialized, you want to have someone who can think, who can adapt, and that’s something that mathematics teaches you how to do,” says Truman’s mathematics and computer science department chair, Dr. Susan LaGrassa. The following math majors tell about their careers after graduating with a math degree and how they are using skills learned in math class to succeed in their jobs. At the California University of Pennsylvania, math and computer science were also the same major. Parsons enjoyed both because he likes logic and working with computers. “There’s a lot of theory in math, and when I was in school, you had to solve a lot of problems using that theory,” he says. After graduation, Parsons got a job developing software for Eastman Kodak. Since then, he’s designed software for the company’s products and manufacturing lines. Now, Parsons maps Eastman Kodak’s plans for launching products. Companies have to take a lot of steps before introducing merchandise to the public, and he makes sure that happens. DenBleyker pursued a job as an actuary because she didn’t want to teach and didn’t know what else to do with her math degree. She started in the actuarial program at Buck, a human resources consulting firm. “When you first start out as an actuary, you do a lot of number crunching,” DenBleyker says. “You need a strong math background for that.” Today, she helps companies set up employee benefit packages. She also keeps clients updated on what’s happening in the health care field and helps them prepare for union negotiations. She takes clients’ problems back to people who work with numbers to find a solution. “Every day’s a fun project to solve,” she says. At first, Lieber was a meteorology major, but that required a public speaking class. Lieber didn’t want to take that, so he switched his major to math. Now, at the Cleveland Clinic, he helps doctors in the Imaging Institute with their medical studies. He makes sure they study the right number of patients and seek the right kind of data. When the doctors have data, he helps them analyze it. “A project that I’m working on can include anything from the head to the toe,” Lieber says. Currently, he’s helping doctors learn if computers can help screen patients for lung cancer. The study will compare the survival rates of people who were diagnosed with a computer and with a placebo machine. Reichenbach took a college class in computer-aided design and liked it enough to help teach it for two and a half years. That helped him get a co-op with Toyota, where he worked in several areas, like engineering design and computer-aided engineering. Today, he uses computers to design parts that go in NASCAR vehicles. Reichenbach took a lot of engineering classes, but said math better prepared him for situations he’s not used to. “You’re always approaching problems that you’ve never seen before,” he says. Partner at Dow Lohnes, Washington, D.C.
After Armstrong got his master’s degree, he went to work for QST, which helps companies research and develop new drugs by planning how to collect medical data and analyze it. Armstrong manages five employees who work with statistics and figures out how to get projects done on time. Much of his job is writing computer programs to sort out the findings of studies. “Math is inherent in what we do in a lot of things,” Armstrong says. At Grand Valley he learned how to write proofs, which is sort of like writing software, because he has to plan where he’s going to end up and sometimes works backwards. See, math isn’t just for accountants! A degree in mathematics can actually lead to practically any career—it all depends on how you use it. Plus, studying math means strengthening your logic, reasoning, and critical-thinking skills, and you’re going to need them no matter what you do. P.S. 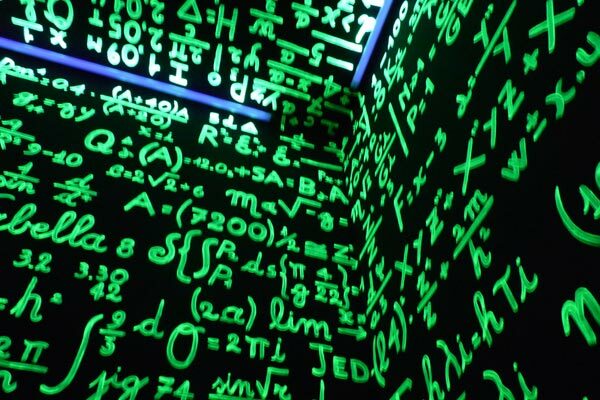 You can search for math scholarships and colleges with math majors on CollegeXpress too!